Raaga.com: Sushant Singh Rajput fulfils his dreams - Purchases Rs 20 Crore penthouse in Mumbai! 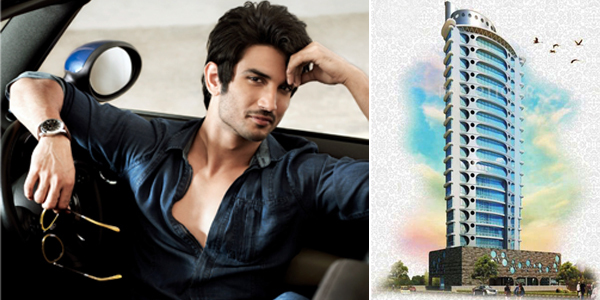 Sushant Singh Rajput fulfils his dreams - Purchases Rs 20 Crore penthouse in Mumbai! With an orthodox surname like ‘Rajput’ Bollywood actor Sushant Singh Rajput was initially discarded by Bollywood like millions of aspiring actor, who land everyday at Mumbai CST with dreams in their eyes to become actors on silver screen. But as the English proverb goes ‘Fortune favours the brave’ there are a few handful enthusiasts who with their sheer patients, diligence and the never say die attitude fulfill their dreams and became stars. In the list of countless stars who conquered the city of Mumbai after a hard smuggle like legendary actors Dharmendra, Jeetendra, Govinda, Jackie Shroff, Anil Kapoor etc. Sushant Singh Rajput is the latest inclusion. The actor who struggled tooth and nail to make his presence felt in Bollywood is today the most sought after star and has reportedly purchased a pent house at whopping price of Rs 20 crore in Mumbai’s post Pali Hill in Bandra, Mumbai. However his hard work paid off and despite no godfather he paved his way into Bollywood solely on his talent and his confidence to make it big! Meanwhile KAI PO CHE star, who is working on a MAHENDRA SINGH DHONI biopic with Fox Studios and is anticipating working with Shekhar Kapur's PAANI, has denied the popular rumors that he has been approached by the makers who are making the Hollywood film’s remake of Hollywood hit THE FAULT IN OUR STARS opposite Deepika Padukone.